The Bullets and Burgers Zip Line combination package is the ultimate outdoor thrill adventure. 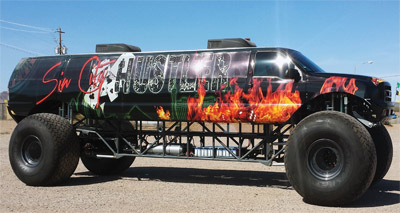 Experience the thrill of a lifetime as you soar through the mountain side reaching speeds of up to 60 miles per hour and experience the adrenaline rush of shooting full automatic weapons. Your adventure will begin with pick up from your Las Vegas hotel in a luxury shuttles by one of our master tour guides. 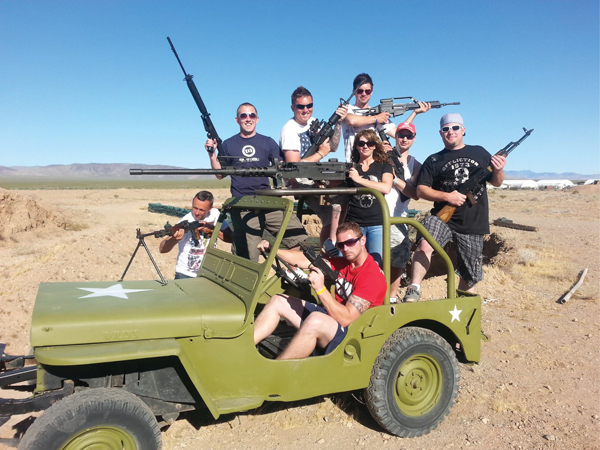 The ride to our range acts as a private guided tour and you will learn the history of the weapons, Hoover Dam, Las Vegas and surrounding areas. Arrive at the Hoover Dam bridge for a 15 minute photo opportunity as you stand 900 feet above the Colorado River on the newly constructed Mike O’Callaghan and Pat Tillman Memorial Bridge. Continue your adventure through the stunning scenic landscape of the Mojave Desert to our private outdoor range. Upon arrival you will be escorted to your private military style bunker set in a unique ‘Desert Storm’ atmosphere. You will have the opportunity to fire a wide range of military and specialty weapons including the Barrett .50 Cal Sniper Rifle, M2 ‘Deuce’ BMG, and Desert Eagle. After getting the blood pumping from the ultimate adrenaline rush, relax at our onsite restaurant where we will serve you our World Famous Burger, fries, and soda. After a one of a kind dinning experience set foot on the second half of your adventure. Arrive at Bootleg Canyon and take to the sky for your Zip Line tour. Hike up historic Bootleg Canyon and take in the sights and sounds of nature as your expert zip line guide explains the history of the area. Breathe in the fresh mountain air and catch a glimpse of the native wildlife including big horn sheep, lizards, and hawks. As you reach the top of the mountain side take in the breathtaking views of Boulder City and Lake Mead as you stand above nearly 1.5 miles up. Soar like an eagle down the mountain side and experience the rush as you reach speeds up to 60 miles per hour. Your journey will end with transportation back to the Las Vegas Strip with memories that will last a lifetime! – All shooters must be 12 years old and 5 fee tall. Children under the age of 12 can participate in this adventure as a non-shooter. – All children under the age of 18 must be accompanied by a parent or legal guardian. – Due to safety concerns, pregnant women are not allowed to participate in this adventure. – For each shooting package only 1 non-shooter package is allowed. Must be an even 1:1 ratio for shooter to non-shooter. – All passengers must weigh 75 pounds to participate with a weight limit of 250 pounds.